Make twelve 16" blocks, add a pieced and applique border, plus 2 outer borders and you have a quick lap quilt that finishes 66" x 82". 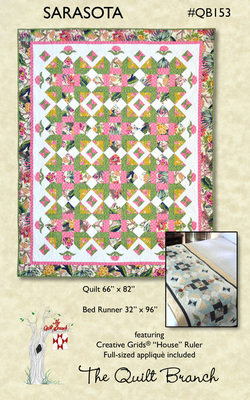 If you only want a bed runner (32" x 96"), make just 5 blocks. This is great for an accent at the end of your queen sized bed, plus you will have warm toes. All the 45° angles are cut quickly and accurately using the House Ruler by Creative Grids®. The pattern includes full-sized applique templates.